Where Can We Hold Our Bar Mitzvah? 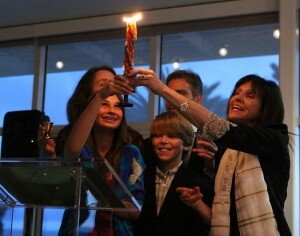 The Bar/Bat Mitzvah Service can be held in anywhere. Some families prefer to celebrate in a Jewish Temple, others are happy with a celebration at home, in a park, hotel or restaurant. The party can also be anywhere you wish. The service can take place either Saturday morning at 10 or 10:30 am or Sat afternoon at 4 or 4:30 pm. Our Rabbis strongly prefer afternoon services. The afternoon service can end with a Havdalah Service to complete Shabbat and then be followed by dinner and a party. Sometimes morning services are followed by an Oneg Shabbat or a luncheon and a party. Other times, morning services are held and the party is held in the evening. The following Temple Sanctuaries may be available for your service, as well as their social halls for the party. (Each temple has its own fee structure) Some Temples will only be available for afternoon services. Other Temples not on this list may also be available. It never hurts to call and ask! Open for rental of sanctuary but reception must take place on site as well. Coldwater Canyon at Mulholland Dr.
Building in the shape of a Torah, set on a mountaintop.